My wife and I did not have any sea kayak experience. 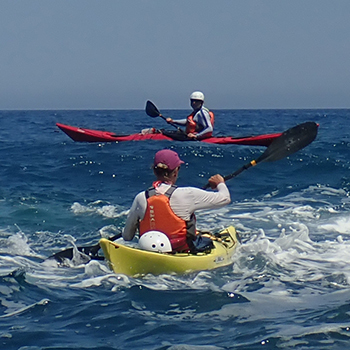 We are both active, in our sixties and needed to be more comfortable in kayaks ready for an adventure we have planned. 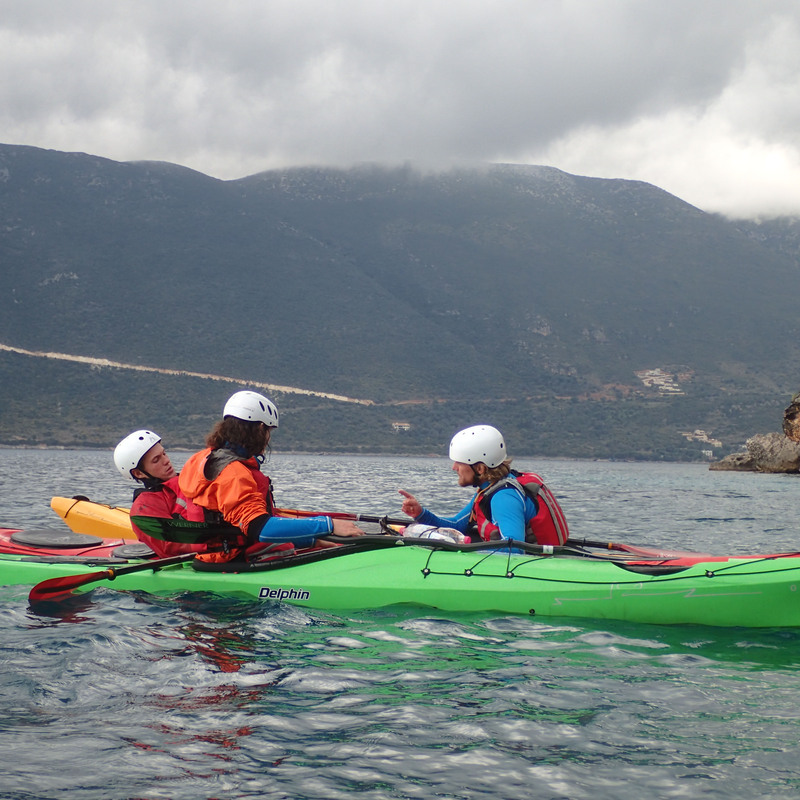 Immediately before the 3 Star course with George at Odysea (Greece), we started with two one-day trips with Kefalonia Kayaks which were very enjoyable and well run, and can also be highly recommended. We then did a 4 day course with George plus the assessment day. 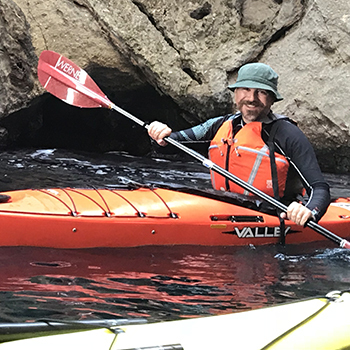 George lived up to his reputation as a passionate kayaker who really wants his students to develop skills and the enjoyment of kayaking. From the start he set the appropriate pace, was patient, informative, and not time constrained. He stretched those in the course as appropriate whilst not pushing those who were uncomfortable going too far out of their comfort zone. He is both very competent and very likeable. His student assessment notes were comprehensive and useful. A highly rewarding 5 days and we had a great time. We will plan to kayak with him again if the opportunity arises. I wanted to thank you for the beautiful come-together, as well as the whole educational process and of course the successful outcome. During the days of the training, your balancing between being a serious coach and having a friendly attitude, as well as your high level of expertise, all contributed positively both to my learning as well as to my mood. Congratulations also for the new equipment that you offer (clothes, boats, paddles, etc. ), as it contributes to the respect and the value of the sport. I’ll come again next year if you can put up with me! Thank you again for this fantastic week around this absolutely gorgeous islands. 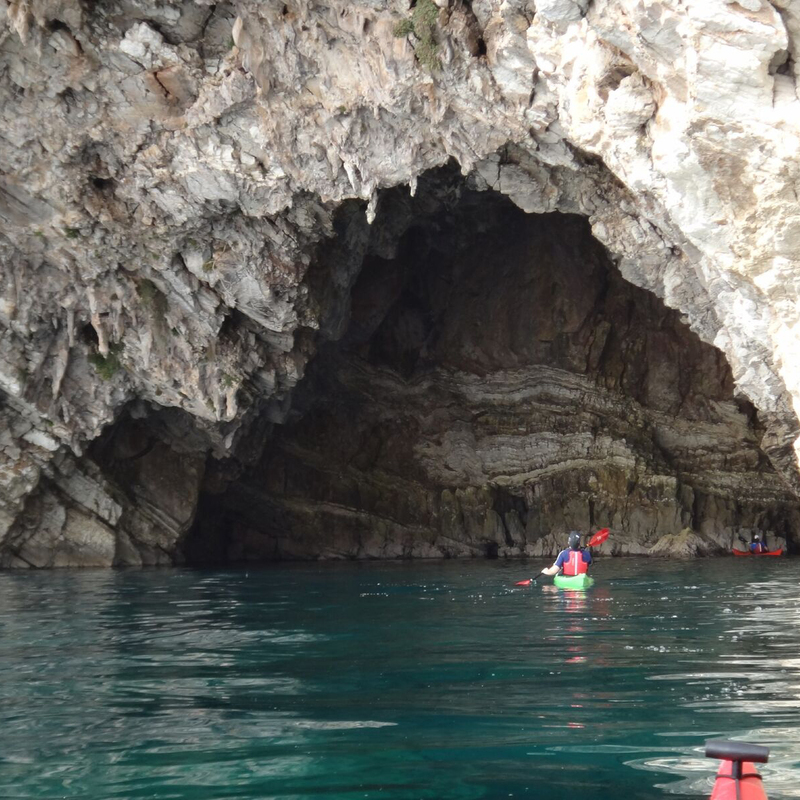 We have had really a great time exploring all the coastline of Paxos and Antipaxos including the countless caves we had paddled in. You had us having fun entire day and also let us feel comfortably safe when you guided us through rock-gardens in waves, what I’ve never been in before. Good to having had a base-camp to let all our stuff there and relax late in the evening while enjoying the fantastic seaview. I enjoyed also the greek lunch you prepared every day for us including a tablecloth on the beach. All the equipment we got, as boats, paddles, live-jackets, lycras, neopren, camping-equipment has been very high standard and quality. All like the equipment my group uses when paddling in our homewaters around the Northsea-islands. I had a very great learning experience with you as a fantastic instuctor. Each of us was teached individual and where he needs to get better. I’m very much looking foreward to seeing you again for another course or tour. Very best wishes and thank you again! I did the BCU3 course with Odysea in 2018. I’m quite experienced and George adapted the course perfectly to suit my level, straying in on BCU4 topics. 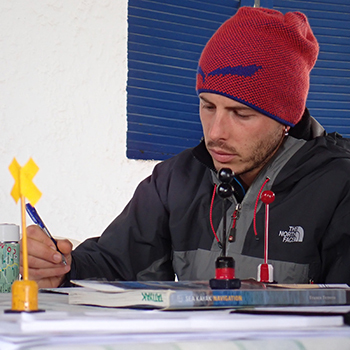 Overall George is a fantastic teacher with an eye for details and with a deep passion for kayaking. Looking forward to come back soon! The four of us still talk a lot about all the wonderful experiences we had paddling with you and Panos in September. with a group that grew together very quickly under your guidance and positiv approach. We certainly would love to paddle with you again! 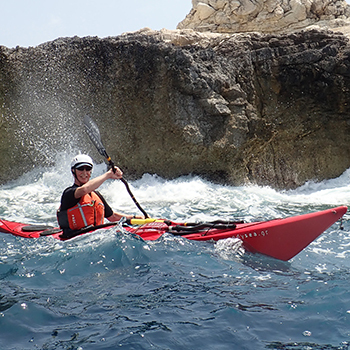 We would like to thank you very much for giving us some fantastic days in your kayaks in the Mediterranean. We really benefitted from your observing us as a group and giving us so much good advice on how to improve our kayaking skills, both individually and as a group. 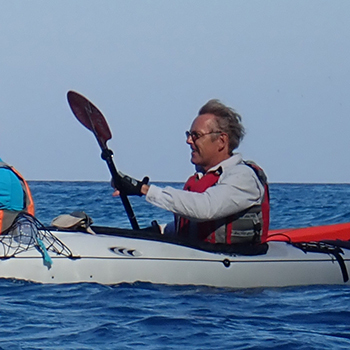 We are a group of 5 from Denmark aged 59 to 69 who have been kayaking for 3-5 years – mostly in Denmark. We googled the Odysea and agreed with George Gazetas on guided tours for 3 days starting out from Lefkas. 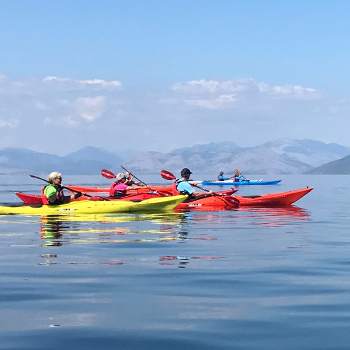 The trips included very beautiful kayaking to the nearby islands, bathing in caves, and a typically Greek lunch in exquisite spots. We saw dolphins close to the kayaks and also experienced paddling in big waves when George and his wife Ania managed to teach us the techniques for high sea paddling. They offered good, stable kayaks and various paddles which also indeed increased the quality and our joy of the trips. We come back home and we are aware that we had a great time in Lefkada island due to its beauty but in the same time due to special people that we had the chance to meet. The kayak journey by odysea.gr was such opportunity to share a very beautiful day with you around Paros bay. We thank you very much for your carreful attention and patiance that made us more confident and relaxed. 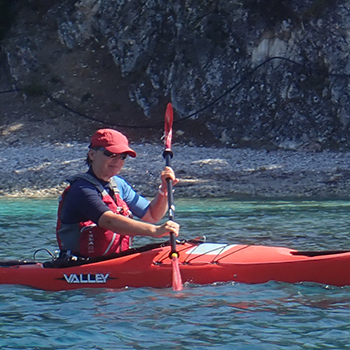 You are high skilfull kayak trainer and a very experienced psychologist, making us to feel all the time in safe hands. The picknic lunch was a delicious and we enjoyed to talk with you about so many things related to this beautiful world and its human concerns. 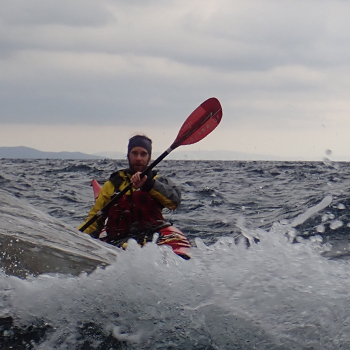 So, it was a not only a sea kayak journy but a very interesting trip in human spirit. And for my friend, as you said, it was a good opportunity for personal development! I follow the BCU 3 star course in Lefkada. It has been an amazing experience. Georse is a fantastic instructor, i loved the way he transmits his knowledge and I am really surprised how much I learned in just five days. I am totally satisfyed with the course and I defenetly recommend it to anyone that love kayaking. And last but not least the location was perfect, with its stunning landscape! Our BC 3 star course with George was really amazeing and productive. George managed to teach a lot of skills in little time and through direct and simple axplanations. His great general knowledge helped me to understand this descipline at 360 dergrees. All the partecipants in the course were taken care of with no distinction between skills levels. I especcially apreciated the devotion of the teacher trying hard to improve our skills and keep the motivation high and the mood positive even in harsh conditions. George took a lot of time for individual teaching and feedback so that I felt an extraordinary personal support during the course. In the end we had a lot of fun in the water, during theory classes and around the dinner table in the evening. Thanks to George and Odysea!